I have a really interesting day job. Not that I don’t find my food/blog life interesting, though it does mostly happen in the evening. I worked for many years, nearly a decade, to get the experience I thought I would need to do the best possible job in a unique role. I feel passionately about the importance and value of the role. Metaphorically speaking, I build bridges between organisations that in many ways are vastly different from each other, but in a complex world, find themselves operating in the same space, with different mandates. This provides me with the opportunity to meet some really diverse groups of people. I was recently blessed to meet a US Marine Corps officer studying at an Australian defence institution. We struck up a bit of a friendship. Along the way, we had a great conversation about barbequing. While there are great barbequing traditions in both Australia and the United States, the traditions are vastly different. The Australian barbeque is mostly about easy cooking on a gas or electric grill; cooking things quickly with a good dose of flavour. Despite the Australian colloquialism “throw another shrimp on the barbie”, I rarely see something as expensive as prawns on a BBQ. I imagine there would be some notable exceptions in prawning communities in the north of Australia. For the most part, barbeques are filled with onions, sausages, chops and burgers. They may also include chicken wings or breasts (‘for the ladies’), steak or skewers. Sometimes they may include seafood or vegetables. My understanding of the barbeque tradition in the US is that it will likely involve charcoal and slow cooking of meat such as ribs or pulled pork. They also often have an element of smoking that is much more deliberate than the fat-fire and charcoaled sausage often seen on an Australian barbeque. From my lovely conversation with the good Marine, I also came to learn that barbequing is also very dependent on the barbeque sauce, which varies greatly from state to state, even from town to town. Some have a vinegar base, some mustard and some ketchup. Who knew!? Then he started telling me about this amazing barbeque sauce from a little town in Kansas called Hillsdale. He said it was sensational, and that he bought a bottle with him to Australia that he would gladly give to me as a gift! I was totally stoked! What a score! It’s taken me a while to open the bottle, but I figured, what better way to christen it than by making some sticky pork ribs? So I did. And they were sensational. You may not be able to get your hands on any of this Hillsdale Bank sauce. While I feel sorry for that, you could probably just choose your favourite good quality barbeque sauce to substitute. 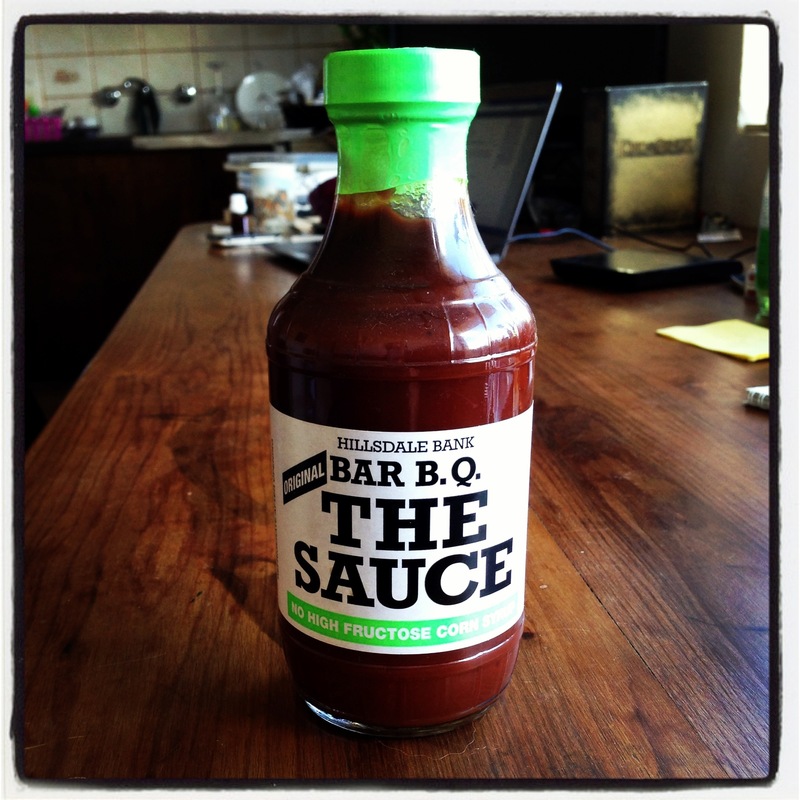 One of the great things about this sauce is its smoky flavour, so go for that if you can. It’s winter here in Australia’s capital, and I do not have an elaborate American style barbeque set up. 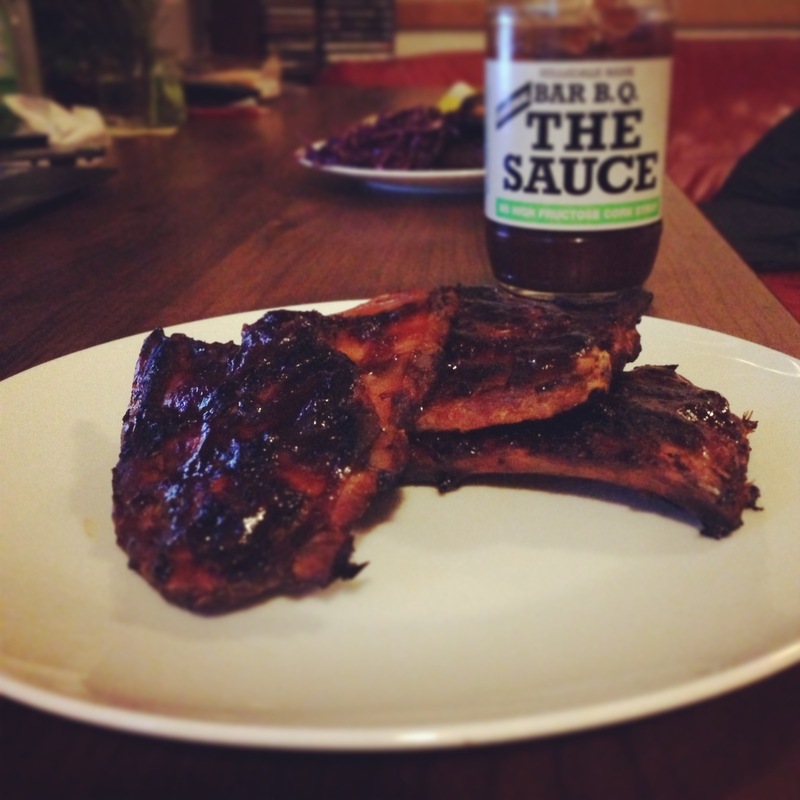 So these sticky ‘BBQ’ ribs, did not actually go anywhere near a barbeque. Just so you know. They were super simple to make and no flame was involved. Place a very large piece of foil on a baking tray, then lay down a square of baking paper (this is optional, but I find it prevents the transfer of any aluminium taste to the meat). 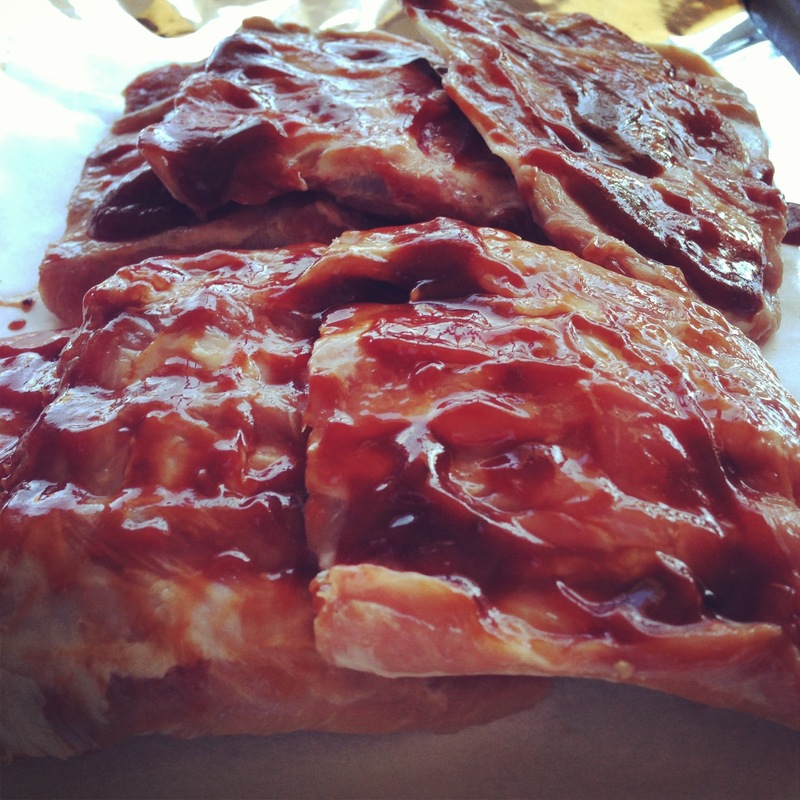 Cover the ribs with a third of the barbeque sauce and arrange on the baking paper. Fold the foil over the top of the ribs and seal. Place in the oven at 130oC for 1 ½ – 2 hours. Increase the oven temperature to 180oC. Unwrap the ribs and douse with another third of the sauce and return to the oven uncovered for 20 minutes. Then douse the ribs with the rest of the sauce and return to the oven for another 20 minutes. Remove from the oven. Serve with coleslaw, jacket potatoes and/or corn on the cob. Enjoy! This entry was posted in Dinner, Thoughts and tagged American food, BBQ, pork, slow cooked. Bookmark the permalink.